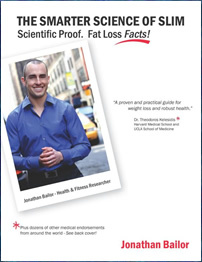 The Smarter Science of Slim is written by Jonathan Bailor, who has collaborated with doctors and scientists for the past ten years, analyzing over ten thousand research papers regarding diet, exercise and weight loss. Bailor aims to condense all of this information into his book in a way that is easy for readers to understand so they can implement a program that will provide a permanent fat loss solution. Bailor summarizes the results of a very large number of scientific studies and reveals unique information dispelling some of the myths related to weight loss. He explains how certain foods dramatically impair our ability to burn fat, how it is possible to lose weight while eating more food and how to fix the underlying conditions that cause us to gain weight. The foundation of the diet plan involves emphasizing foods that allow you to eat more and still lose weight. These foods have a high amount of nutrients in comparison to the energy they provide. Primarily this includes non-starchy vegetables and lean proteins, which are relatively low in calories, yet fill you up quickly and keep you satisfied for a long time. Consuming these high quality nutritious foods also heals the hormones that control your body’s ability to burn fat. Dieters are advised to eat ten or more servings of non-starchy vegetables each day. Bailor says this is easiest to do if you make smoothies containing green vegetables with berries or oranges and whey protein. The Smarter Science of Slim outlines “five steps to eating more smarter”. Eat so many non-starchy vegetables and lean protein that you are too full for starches and sweets. Remember your ancestors. Dieters are advised to avoid grains as well as any other food that requires preparation other than cooking or blending. Buy groceries in bulk to save money. Spinach, lettuce, green beans, broccoli, alfalfa sprouts, tomatoes, peppers, asparagus, celery, onion, zucchini, mushrooms, snow peas, beef, shrimp, tuna, egg whites, whey protein, low-fat Greek yogurt, cottage cheese, natural peanut butter, almonds, ground flaxseeds, berries, kiwi fruit, tangerines, avocado, unsweetened cocoa, stevia, Splenda, green tea. According to The Smarter Science of Slim you only need to exercise for ten to twenty minutes each week but it must be “high quality exercise”. Rest days are very important because they allow for complete muscular recovery between your workouts. Once a week you will do ten minutes of a special form of weight training using high resistance, followed by two days of rest. The next day you will do ten minutes of high intensity cardiovascular exercise, followed by three more days of rest. He says this regime has the effect of working our deepest muscle fibers, which triggers the hormonal changes necessary to promote the burning of body fat. The Smarter Science of Slim: What the Actual Experts Have Proven About Weight Loss, Dieting, & Exercise, Plus, The Harvard Medical School Endorsed Program To Burn Fat Permanently retails at $34.95. Click here to buy this book for a discounted price. Based on clinically proven research. Dispels common myths about dieting and weight loss. Only requires twenty minutes of exercise a week. Requires elimination of many foods including bread, pasta, rice and desserts. Diet has the potential to become boring and repetitive. Difficult to eat out and stick with the program. The Smarter Science of Slim presents the results of tens of thousands of research studies related to dieting and weight loss in a way that is easy to understand. It will appeal to readers who would like to learn more about the science of weight loss and prefer to follow uncomplicated meal plans that don’t require a lot of time for food preparation.